Severely damaged in a fire in 1731, this psalter was part of the collection of Robert Cotton which eventually became part of the British Library. It was made in Ireland, although where is not known for certain. An inscription, now lost, was supposed to have connected it to a person called Muiredach. The most well-known Muiredach was abbot of Monasterboice in the early 10th century, and usually the psalter's origin is placed there for that reason. Also, some of the decoration in it resembles carvings on the stone Cross of Muiredach at Monasterboice. A picture of David as musician or composer of the psalms is barely visible on this damaged page. 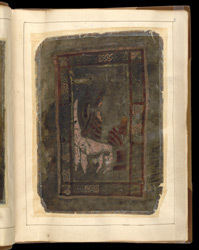 He is seated profile on a throne that has the form of an animal. With his face turned to the viewer, he holds an elaborate harp that is decorated with animal forms. A lock of his hair curls into a swirl of interlace and his robe is rendered as a series of graceful curving lines. The picture is framed with panels of interlace and fret patterns. It is meant as a sign of the divinely inspired author rather than a real-looking portrait.